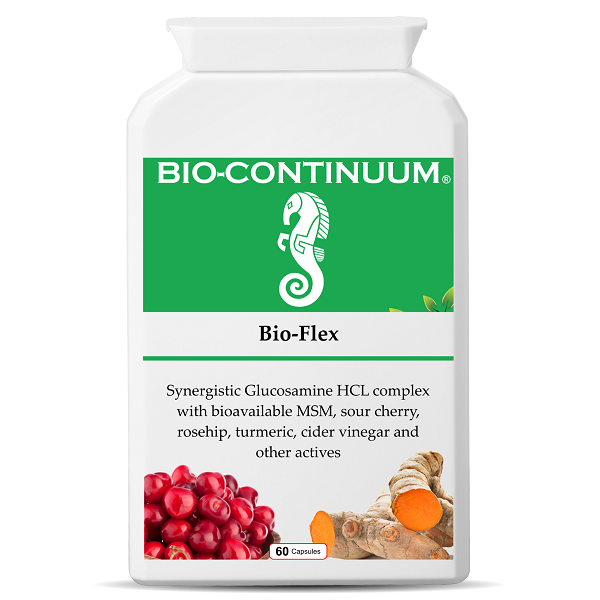 A combination formula with glucosamine HCL, MSM, herbal and food-based ingredients: brown rice flour, celery seed powder, nettle leaf extract (4:1), Panax Ginseng powder, apple cider vinegar powder, bromelain, curcumin, horsetail herb extract, kelp, papain, rosehip extract (20:1), Montmorency cherry extract (10:1) and ginger root extract. Glucosamine HCL: Glucosamine is an amino sugar that is produced naturally in the body. It is a part of the building material for joints and the cellular ‘glue’ that holds the body together. Joint cartilage contains the highest concentration of glucosamine. It is also found in seashells, or it can be made in the laboratory. 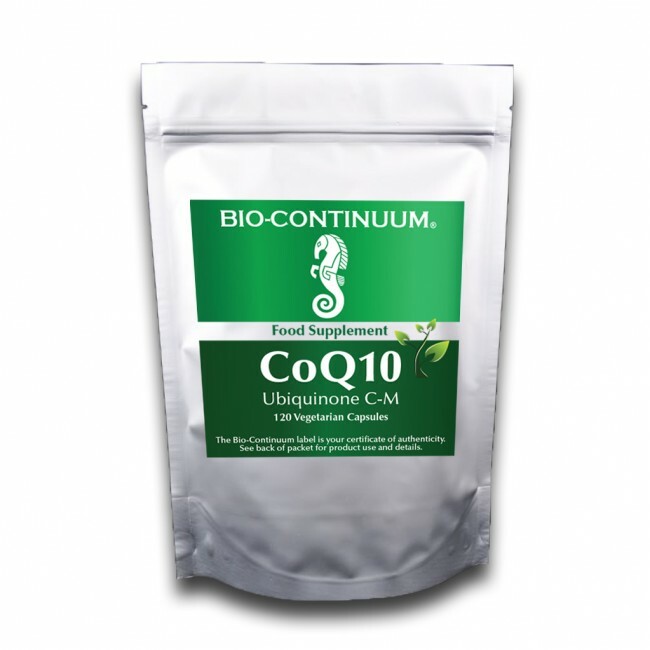 Glucosamine hydrochloride is one of several forms of glucosamine and the glucosamine HCL contained in this food supplement is derived from shellfish. MSM: MSM stands for methylsulphonylmethane, which is a source of the mineral sulphur. Sulphur is involved in a number of functions in the body, including detoxification and body tissue building. Rosehip: Rosehip is the fruit of the rose plant. 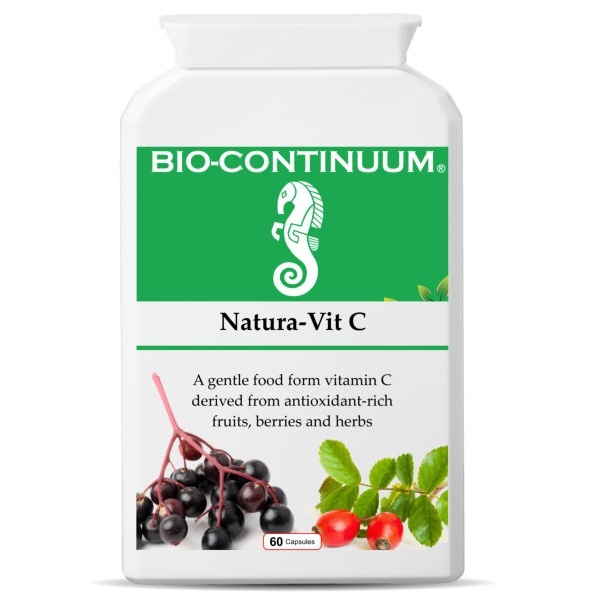 It is naturally high in vitamin C and also contains the carotenoids beta-carotene, lutein, zeaxanthin and lycopene. Nettle leaf: Nettles are naturally high in chlorophyll (a green pigment and phytochemical present in all green plants),vitamin C, serotonin, histamine, acetyl-choline and minerals (including iron, calcium and silica). 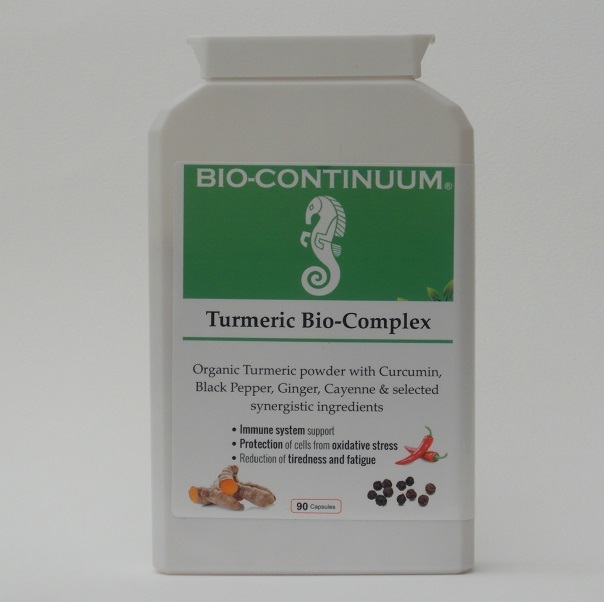 Curcumin: Curcumin is the yellow pigment associated with turmeric, and to a lesser extent ginger. Ginger root: Ginger, aka Zingiber officinale, is a rhizome – a thick underground stem that sprouts roots and shoots. This “hot” spice is native to warmer parts of Asia, such as China, Japan, and India, but is now also grown in parts of South American and Africa. It is a source of vitamin C, magnesium, potassium, copper and manganese. Zingerone, shogaols, gingerols and volatile oils give ginger its distinct aroma and flavour. Celery seed: Celery seed contains apiol and coumarins, as well as the minerals iron, phosphorus, potassium and sodium. Montmorency cherry: Montmorency cherries are a type of red, sour cherry – Prunus cerasus. They are a source of dietary fibre, copper, manganese, vitamin A and vitamin C. They also contain naturally-occurring phytochemicals (compounds found in plants), including anthocyanins – which give the cherries their distinctive red colour – and melatonin. Other plant phenols present in Montmorency cherries include: chlorogenic acid, ellagic acid, gallic acid and quercetin. Panax ginseng: Ginseng is any one of the 11 species of slow-growing perennial plants with fleshy roots, belonging to the genus Panax of the family Araliaceae. Panax ginseng is the botanical cousin of Siberian ginseng. It is a source of phyto-oestrogen and eleutherosides. Apple cider vinegar powder: Apple cider vinegar is fermented juice from crushed apples. Like apple juice, it probably contains some pectin; vitamins B1, B2, B6 and C; biotin; folic acid; niacin; and pantothenic acid. It also contains enzymse and small amounts of the minerals sodium, phosphorous, potassium, calcium, iron, and magnesium. Apple cider vinegar can also contain significant quantities of acetic acid and citric acid. Bromelain: Bromelain is an enzyme derived from pineapple juice. Use is growing in popularity among athletes. Horsetail extract: This common herb supports calcium absorption and utilisation and is rich in silica and mineral salts (including potassium, manganese, magnesium, sulphur and calcium). A deficiency in silica tends to precede the calcium loss that causes demineralisation of bones. Kelp: Kelp is a large edible seaweed (algae), which grows in underwater “forests” in shallow oceans. 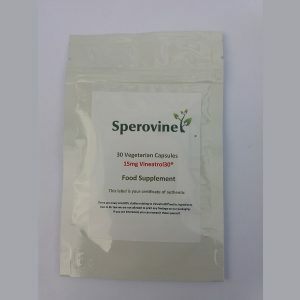 It contains vitamins (such as A, B1, B2, C, D and E), minerals (such as iodine, vanadium, zinc, magnesium, iron, potassium, copper and calcium), enzymes (haloperoxidases), amino acids (including tryptophan, threonine, isoleucine, methionine, cysteine and valine) and chlorophyll. Papain: Papain is an enzyme derived from the papaya fruit. Not many people think about nourishing their skeleton. There is often a belief that, once bones are formed, they are there for good and will remain in good condition. However, our bones, just like every other part of our body are continually being rebuilt and renewed. They are structures of protein and collagen, which collect mainly calcium, plus phosphorus and magnesium.